Divide the Government: A Strategy for Fiscal Sanity? On Tuesday, November 8, 2016, Americans face a dismal choice between what many believe to be the two worst presidential candidates ever nominated in the same election by the major political parties during their lifetimes. Faced with such lousy choices, voters might want to consider ways in which they can use their vote in 2016 to minimize the future damage, particularly with respect to the nation’s fiscal policies, where the national debt will soon exceed 20 trillion dollars, having nearly doubled during the past eight years. To that end, there is strong evidence from President Obama’s time in office suggesting that dividing control of the government, between the party that controls the White House and the party that controls the Senate and House of Representatives, can keep a lid on the growth of the national debt. In the first two years of President Obama’s time in office, the Democratic Party controlled the White House, the House of Representatives, and the Senate. 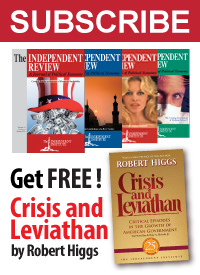 During that time, the growth of the national debt skyrocketed, growing at a steady rate from $10.6 trillion to $14 trillion in just two years, despite the end of the Great Recession less than six months after President Obama was sworn into office. That kind of result would not appear to be a fluke, as it has certainly been demonstrated during the last six years. 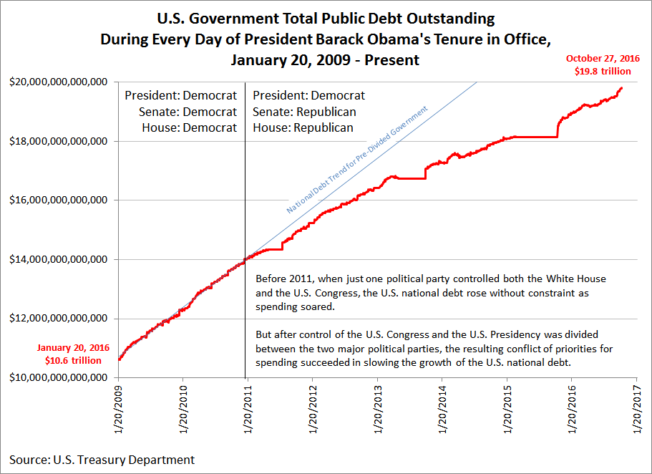 Without that change, had the Democrats controlled Congress after 2010, we would have seen the total public debt outstanding of the U.S. government breach the $20 trillion level back in 2014. Instead, it will have taken just over two years longer for it to pass that grim milestone. If that does not sound like a great success, that’s because it isn’t. But compared to the path the nation had been on, it is a better alternative. 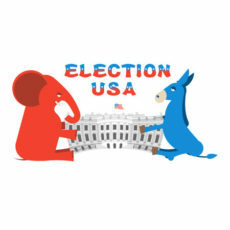 The real challenges won’t be addressed until we fix the real problems of politics, which will mean bringing forward candidates who are recognized for their genuine sincerity and candidness, rather than by their crafty and cunning selfishness, to borrow a turn of phrase from a former President who both believed in fiscal responsibility and delivered it.